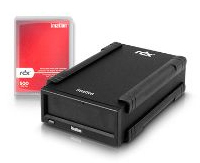 Imation RDX makes data backups easier, more reliable, more secure and now even faster. The RDX Removable Hard Disk Storage System now features certified USB 3.0 SuperSpeed. Imation RDX External USB 3.0 is backward compatible with USB 2.0 systems, while delivering transfer rates of up to 230MB/s (USB 3.0). The RDX system uses rugged, removable disk cartridges and docking stations to back up data like a tape drive, with the instant access of a hard drive. Cartridge capacities range from 160GB to 1TB. RDX is a smart replacement for 8mm, VXA and DLT performance tapes. Its enterprise-class features provide the data protection of large IT data centers, so it can support your company as it grows, and at an affordable price. As your data needs expand, simply add more removable disk cartridges — and never run out of space. Get great results with Custom Disc Printing on all Medical Grade DICOM compliant CDs & DVDs! With data as vital as patient studies, doesn't it make sense to use the very best? That's why all MedGrade™ DICOM compliant CDs & DVDs utilize the highest quality media available. Let us help you create a professional looking design with Custom Disc Printing by MedGrade!